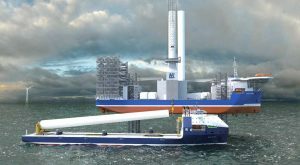 Classification and technical advisory services provider ABS has granted an Approval in Principal (AIP) to Neptun Ship Design for its Wind Turbine Transport Vessel design, said to be the first to support transporting parts for turbines greater than 9MW. The 178m long Blue Azurit design allows wind turbine manufacturers to produce full length welded towers ready for installation, according to ABS. The vessel is designed to pick up components directly from a supplier’s berth, transport parts to an offshore harbor, or feed them to an installation vessel. “The ABS extensive offshore industry experience made them the natural choice to support this project. Blue Azurit will help the offshore wind industry meet pressure to reduce costs, minimize project risks, deliver higher reliability and support renewable energy targets from new offshore wind nations,” said Gerald Hadaschik, Neptun’s Managing Director.